The Grand Slam is a fantastic, five-bedroom vacation home within the exclusive Champions Gate resort. Only fifteen minutes’ drive away from Walt Disney World, this vacation home benefits from all the community amenities, including two, Greg Norman designed, eighteen hole, championship golf courses, a swimming pool with private cabanas, a heated family pool with waterslide and lazy river, fitness center, a restaurants that will deliver food to the villa even ! You’ll certainly feel like you’ve hit a grand slam at this property! The villa has a stunning, aquamarine pool with spillover spa, with an overhead screen to protect from the elements. Enjoy the glorious Florida sunshine on an outdoor sofa, sun lounges or a patio table with two seats. It’s easy to unwind and begin to take it easy here. Sliding glass doors lead into a light, open plan living and dining area. An elegantly designed lounge features two, modern sofas and accent chairs overlooking the pool deck and a built-in, flat screen TV. A modern dining table for up to eight guests is bordered by white, studded, leather chairs and there are three padded bar stools at the kitchen island. This is a great place to grab a morning juice before heading to the pool. The kitchen is fully equipped to allow the chef in the family to stock up and prepare meals when needed. It has all the necessary dinner and glassware to serve up in style and a dishwasher to save cleaning afterwards. Florida vacation villas are usually designed with entertainment in mind and The Grand Slam is no exception. The main living area has a large, flat screen TV and the upper floor loft area has one too, as well as an X-Box games console and pool and ping pong table. Every bedroom at The Grand Slam comes with its own TV with complimentary Wi-Fi. Downstairs, there is a king sized bedroom and a family bathroom with shower/bath combo. The laundry room is also located on this level. Upstairs, there are a further four bedrooms, including another king sized suite with ensuite shower and twin vanities and a king sized Master bedroom, which has a ensuite with shower, tub and twin vanities. Disney fans will love the ‘Frozen’ themed bedroom, with the character Anna adorning the wall, a pretty chandelier above and frilly, blue bed covers. This room has two, twin-sized beds and an ensuite with shower/bath combo. 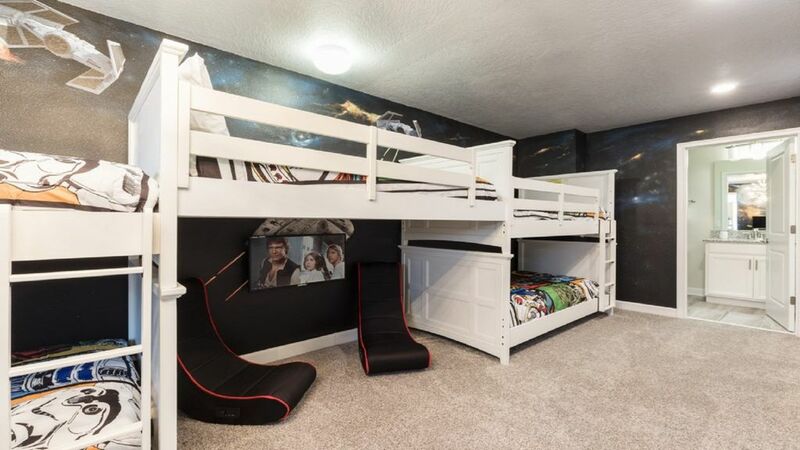 Boys will hide away in the ‘Star Wars’ themed room for hours! It has three sets of bunk beds, with four gaming chairs, an X-Box games console and a large, flatscreen TV. The Deathstar and Tie Fighters adorn the walls and children can cuddle up with a BB8 teddy. This room includes an ensuite with shower/bath combo. With so much onsite, you’d be tempted never to leave Championsgate, but, if you do, be rest assured that all the theme parks are on your doorstep! Ping Pong Table is part of the games room in the home. This is part of the games room in the home. A heated pool is an additional charge. This house was exactly what we needed. We had 6 people and everyone had their own rooms and plenty of space inside. The drive to the parks is 15-30 depending on traffic. We enjoyed the off park days at the house by the pool and were very comfortable. My only complaint is that the homes are very close together so there isn’t much privacy when you are in the pool/hot tub. This review is very much appreciated and really warmed our hearts. Here at Florida Premier Rentals we’re a close knit bunch and we handpick all our vacation rentals in Orlando, so when someone reviews a rental, we feel really great. So glad that you enjoyed your vacation and we do hope that you’ll be back in touch next time you’re planning on visiting the sunshine state! A beautiful home that was comfortable and very spacious for a large family. It was a wonderful experience for a multi-family vacation. The home was spotless and the beds were very comfortable. It’s always great to receive positive reviews here at Florida Premier Rentals and we’re grateful that you took the time out to let us know how your vacation rental was. we pride ourselves on ensuring you’re happy with your home from home. We hope to welcome you back to Florida soon and thanks again! Beautiful clean house with fun themed rooms. New house-very nice. However, there were a few items we would have appreciated such as community map and information on the club house. For example, we would have ordered takeout from the club house restaurant on the day of our arrival if we had known that was an option. Definitely a hike to Disney if traveling during rush hour-some days it took us over 40 minutes each way. The house was immaculate and the themed rooms were definitely a big hit. Kids were a little disappointed there weren’t any games for the Xbox, but we stayed busy with other activities. Overall, beautiful clean house with attentive staff. The house was very clean and close to the Disney Parks. The kids enjoyed the pool and the themed bedrooms. There are many restaurants and shops close to the house. Great place to stay! next year! Here at Florida Premier Rentals we’re always up to date on what’s happening in the area and add new vacation homes to the list all the time. We hope that you visit again soon! We spent one week in this house and overall experience was good, with a couple minor items to take note of. Prior to arrival we had been given a door lock code, once we arrived we found out that the code sent to us was wrong, however we called the property manager and they gave us a new code immediately. During our stay the weather was colder than normal and at times we wanted to take a nice warm shower however the hot water temprature was almost near freezing. Also we had requested the pool heater to be on, and after arriving the first day we realized that it was not on so we called the property manager and they came and turned it on. These are the few items that we experienced on the Lowe side, however the house itself is amazingly large and can fit many ppl easily. Everything is brand new and we had a great time staying in the house.